According to Geography, after separating from Panjiya Indian plateau moved towards north; collided with Eurasian plateau and Himalaya mountain rang was formed on the process. What happen instead of hitting, Indian plateau come close to Asia and then stop the movement thus forming an island? No boundary problems no need for building barbed wires across the Line of Control etc. But past is past. Its collided and become the part of Asia. Due to boundaries boundary problems started, wars initiated thousands of people died, but boundary problem still not died. years; US also provides other goodies to Pakistan like armed maritime surveillance aircraft, new generation missiles, F-16 fighters, 155mm artillery guns, C-130 Hercules Transport aircraft, attack Helicopters etc. "Pakistan has an estimated arsenal of about 70 –90 nuclear weapons and is busily enhancing its capabilities across the board. A new nuclear-capable ballistic missile is being readied for deployment, and two nuclear capable cruise missiles are under development. Two new plutonium production reactors and a second chemical separation facility also are under construction." "Following the example of other nations that have developed nuclear weapons, Pakistan is improving its weapon designs, moving beyond its first-generation nuclear weapons that relied on HEU. For atleast a decade, Pakistan has been pursuing plutonium-based designs. Central to that effort is the 40–50-megawatt heavy water Khushab plutonium production reactor, which was completed in 1998 and is located at Joharabad in the Khushab district of Punjab. Six surface - to air missile batteries surround the site to protect against air strikes. As a sign of its confidence in its plutonium designs, Pakistan is building two additional heavy water reactors at the Khushab site, which will more than triple the country’s plutonium production." 70-90 Nuclear weapons, a new nuclear-capable ballistic missile is being readied for deployment, and two nuclear capable cruise missiles are under development. These developments which needs huge capital infusions are appening at a time when the country is virtually on a civil war and the economy is on the edge of collapse. Not only this the number of internally dislocated people due to operations against Taliban will be in lacks if not millions. Even in the midst of insurgency activities which is already questioning the integrity of the country, Pakistan is not ready to move the army from its eastern borders(with India) to western borders where the US-Pak operations against insurgents are going on. "The Babur appears to be similar to the new Chinese DH-10 air-launched cruise missile and the Russian AS-15. The Babur is significantly slimmer than Pakistan’s ballistic missiles, which suggests that Pakistani engineers have made progress in warhead miniaturization, perhaps based on a new and smaller plutonium warhead. A submarine-launched version of the Babur, which has been rumored to be in the work, has not yet materialized." Why Pakistan or any country an a missile? Either to attack or to Defence. Who will be the first enemy of Pakistan? Taliban? Afghanistan? Iran? India? China? or US? Russia? No prize money for the answer. Its India of course. Amid of this another controversy broke out. This time the main hero was an Anti ship missile - Harpoon. Harpoon is an anti ship missile developed by McDonnell Douglas( Now Boeing Integrated Defense Systems). It can be launched from a Fixed-Wing Aircraft, Surface Ship, Submarines or Coastal Defence batteries.This is the same missile which reportedly destroyed Much of Iraqi Navy in the First Gulf war. The accusation by US was that Pakistan modified the anti ship missile to attack land targets which violates end user agreemnt. Now who is the land target? Any doubt? "The American accusation was “incorrect.” The official said that the missile tested was developed by Pakistan, just as it had modified North Korean designs to build a range of land-based missiles that could strike India. He said that Pakistan had taken the unusual step of agreeing to allow American officials to inspect the country’s Harpoon inventory to prove that it had not violated the law, a step that administration officials praised." "Robert Hewson, editor of Jane’s Air-Launched Weapons, a yearbook and Web-based data service, said the Harpoon missile did not have the necessary range for a land-attack missile, which would lend credibility to Pakistani claims that they are developing their own new missile. Moreover, he said, Pakistan already has more modern land-attack missiles that it developed itself or acquired from China. “They’re beyond the need to reverse-engineer old U.S. kit,” Mr. Hewson said in a telephone interview. “They’re more sophisticated than that.” Mr. Hewson said the ship-to-shore missile that Pakistan was testing was part of a concerted effort to develop an array of conventional missiles that could be fired from the air, land or sea to address India’s much more formidable conventional missile arsenal." The point is not if Pakistan altered the Harpoon or not. But they have more capable missiles than Harpoon. Like Abdali-I (BRBM),Ghaznavi (SRBM),Ghauri (missile) (MRBM), GhauriII(MRBM), Ghauri-III (Close ICBM), Hatf-I/IA (BRBM),Shaheen missile (MRBM),Shaheen-II (IRBM), Shaheen-III (IRBM),Babur missile (Cruise Missile), Ra'ad (Air Launched Cruise Missile),MAR-1 etc. They are becoming more and more sophisticated. Look at our situation, we still don't have a ICBM(Inter Continental Ballistic Missile) - Surya missile is yet to develop. 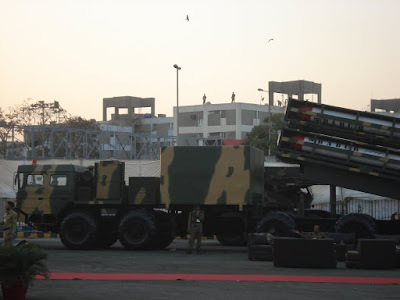 In short If there a war with China in the future how many Indian missiles will reach the distant Chinese regions? But almost all of India may come under the range of Chinese missiles. Our neighbors are moving with all the pace they can. The people who can laugh at this moment will be the Defence Equipment Manufactures only. We can't buy the US government's words as it is. Their objective is some how attain victory in Afganistan and move out of the country. They may sell the defence equipments to India; its business. But our security will be on our hands only. We have to design it, develop it. One more question will US stop or put conditions on $7.5bn aid to Pakistan? I think no. They will talk about conditions, but in th end it will become a blank cheque. After all US's south asia plans starts from Afganistan and ends in Pakistan.